The home of the University of Oregon Department of Mathematics has some new décor. “SubDivision,” a site-specific sculpture by Los Angeles Artist Volkan Alkanoglu, has been installed in the Fenton Hall atrium by the Oregon Arts Commission. Alkanoglu was chosen for the project by an art selection committee made up of UO faculty, staff, the architect for the building's recent renovation and Eugene-area art professionals. The committee encouraged artists to propose sculptures that would trigger communication among the math department faculty and staff on Fenton Hall's three floors. Artists were asked to incorporate mathematical themes into their work, such as various combinations of symmetry and random patterns. Alkanoglu's piece – made of 550 flat, tessellated sheets of painted aluminum riveted together to create a curved polygon – ties together the three floors both visually and physically. 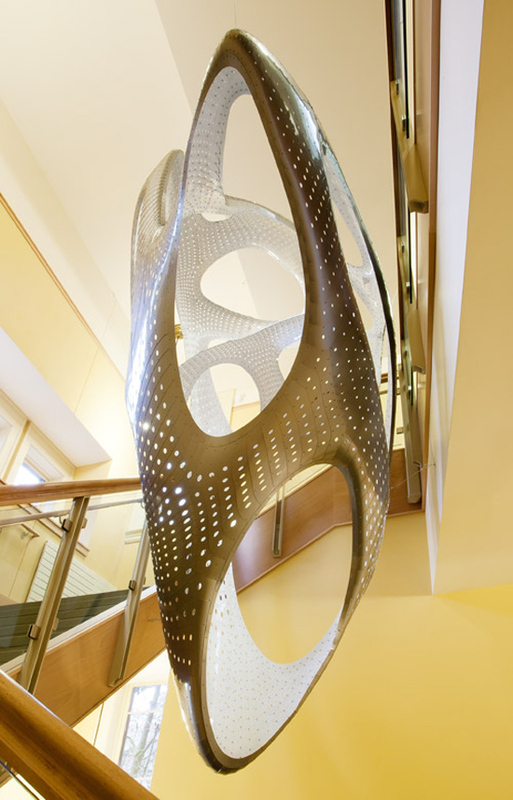 The sculpture is suspended along the atrium's stairwell. The artwork was developed as a contrast to the architecture of the building and is hollow, with a smooth surface. A custom, scripted algorithm was used to create each of its pieces. Alkanoglu – who was born in Turkey and raised in Germany – is the founder of Volkan Alkanoglu/DESIGN LLC. He received his master's degree in architectural design from the Bartlett School of Architecture, University College in London. Alkanoglu's work has been exhibited at the Royal Academy of Arts in London and the Centre Pompidou in Paris. He was nominated in 2006 for the Young Architect of the Year Award in the United Kingdom. He serves on the design and visual studies faculty at SCI-Arc at the Southern California Institute of Architecture, in Los Angeles.